It has been a long winter, setting records for snowfall. You might say it was a winter for the history books and, although we at the Langlade County Historical Society have been busy, we definitely are ready for spring. Starting on Tuesday May 7th, the museum will be switching to summer mode with expanded hours. The museum will be open from Tuesday through Saturday, 10a.m. to 4p.m. The Deleglise cabin and 440 Locomotive will once again be open to visitors. To tour the cabin or the locomotive and caboose, register at the museum desk during regular hours and one of the docents or curator will accompany you to the cabin or locomotive. As usual we try to accommodate groups for special tours during off hours whenever possible. This past winter, in addition to being open limited hours, we have been planning and fundraising for a major remodeling project. This is discussed elsewhere in this newsletter. Planning is going well but we must still continue to raise money for daily operations including maintaining the building and its artifacts and archives and being available to help researchers and lead tours. Since we are entirely self-reliant financially we depend on grants and fundraisers to continue daily operations. One major event is our annual spring rummage sale. On Saturday, June 8, the museum will once again host its sale, selling items at the museum grounds from 8 a.m. to 1 p.m. We are accepting donations to sell at the museum. If you have any hidden treasures in your attic or garage, please consider donating them to the museum. Drop off items or call us at 715-627-4464 during regular museum hours. (Sorry but we cannot accept large appliances or clothing.) This is one of our major fundraisers. Please consider donating and shopping at the museum. On Monday, June 10, we will be serving refreshments at the Music in the Park concert. Donations of pies or other baked goods would be appreciated. Please bring them to the concert site on the day of the concert. See you there! In recent years a regular summer event at the museum has been our Railroad Picnic. We will not behosting this event this summer because we may be in the midst of remodeling. It is hoped that by the following summer we will be able to to show an improved, handicapped accessible, building as part of a major summer event. For over a century the people of Antigo have justifiably prided themselves in their efforts to preserve their history. In 1914 they saved the Deleglise cabin from destruction by moving it to the grounds of the Carnegie Library (now the museum). In the 1920s a group formed to preserve and display artifacts of the county�s history � which in 1997 returned to its original home, occupying the entire Carnegie Library. Many people have contributed to these efforts over the decades. But sometimes even historians must change with the times and recently museum staff and volunteers have been doing just that by through the internet. 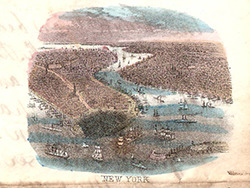 Many aspects of our history are on our own web site and we continue to add to that collection. Another method is through our Facebook page. Recently, thanks to the efforts of curator Mary Kay Wolf, we have become more active in showing life in Antigo over the years by posting photos on Facebook. In some weeks over 30,000 views have been recorded and conversations have taken place among viewers who share memories or answer questions asked by others. If you are on Facebook check it out and join in the conversation. Two other sites provide us with an opportunity to reach out to a wider public. Recollection Wisconsin hosts a site where museums and libraries, including ours, post photographs and documents in their collections. In 2018 there were over 10,000 views of our collection. A Swiss scholar, writing a book on Swiss immigration to the U.S., requested permission to use Francis Deleglise�s recollections of his Civil War experiences in his book. Another request came from a theater group in Ontario, Canada for permission to use our photographs of logging camps in the design of sets for a theater production. We can hardly wait for the DVD of the comedy which they promised to send. A second site is Wisconsin101: A History in Objects. Museums such as ours submit a photograph of an object along with some stories related to the object. Together these stories tell the history of Wisconsin. We have published photos and stories related to three objects: a pillow sham made for an enrollee to the CCC Camp in Elcho by his sister, a bowling pin made by the Vulcan factory in Antigo, and a fishing lure made by Mepps. https://wi101.wisc.edu/ or https://recollectionwisconsin.dp.la/ to find content from our area. It has been a very busy winter at the museum. Last summer and fall, after some false starts, we finally developed a preliminary plan on how to proceed with the remodeling of the building. The primary goal was to make the building handicap accessible. If fundraising permitted we would like to improve the interior, especially with updates to the lighting, HVAC, and ceiling repairs, thereby enhancing the appearance and function of the display and research spaces. Some of the interior remodeling of the 1960s is definitely showing its age and further modifications made to the heating system in the early 2000s, while practical, are very unattractive. Our museum deserves a better look than what it has now. Over the winter we have continued to work with a Wausau based architect, Rod Cox, who has experience working in Antigo at St. John�s Church. Preliminary plans have been developed which involve the addition of a new structure at the north side of the building to house an elevator, restrooms on all floors, and perhaps some display space. 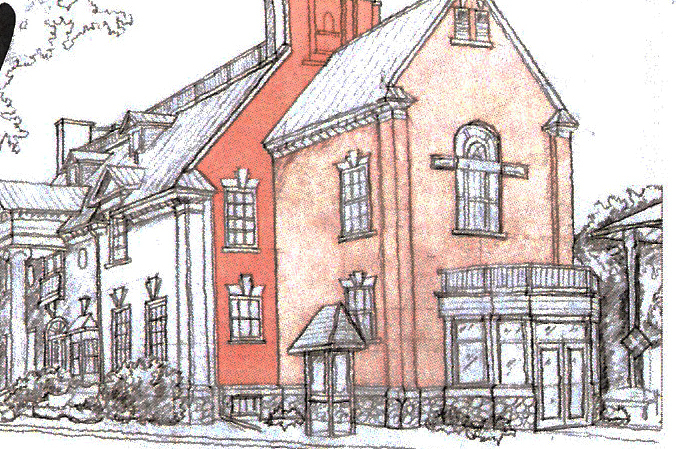 The new structure�s design will be compatible in style with the main building which was built in 1903-1905 and designed by a prominent Wisconsin architect, Alan Conover. It is on the National Register of Historic Places. More detailed plans are in development at this time. We hope that some construction may begin by summer but nothing that will interfere with the museum being open during the summer, our busiest time. We hope by Saturday June 8th , when the museum will be holding its annual rummage sale fundraiser, we will have further developed plans to display and share with anyone interested. Whether you are shopping or not, please visit on June 8th to find out how our remodeling plans are taking shape. When we began our planning we set ourselves an ambitious goal of raising $500,000 for the entire project with plans to eliminate some interior redesign if we fell short of our goal. To date the fundraising has been going very well thanks to the support of the community. Although we are not at our goal yet we are inching forward. Contributions have come from a few major donators and a great many smaller ones. Together they are adding up and we see no reason yet to revise our plans. These are exciting times as we work to adding to the legacy of the people of Antigo who have a long tradition of supporting our history as well as other community institutions. The Wolf River has a long and storied history, particularly the portion running through eastern Langlade and Menominee Counties. The Wolf has played a major role in economic development of the region, extending from the Civil War, through the heyday of logging river drives, and, more recently, as a popular tourist destination. 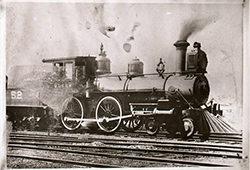 In the 1860s path of the Wolf, long used by American Indians, was proposed for development of the Lake Superior Trail and the Military Trail: a way to move troops from the Michigan Upper Peninsula to Green Bay, in case the British, via Canada, entered the Civil War siding with the South. Its military value was doubted by some at the time. It never proved of military value but the routes were later used by trappers, loggers and eventually settlers. In the 1870s a series of dams made log drives possible. It is estimated that in 1873 half a billion board feet of timber floated to mills in Oshkosh. By the early 20th century railroads had replaced river drives and work began to restore the wild nature of the Wolf. 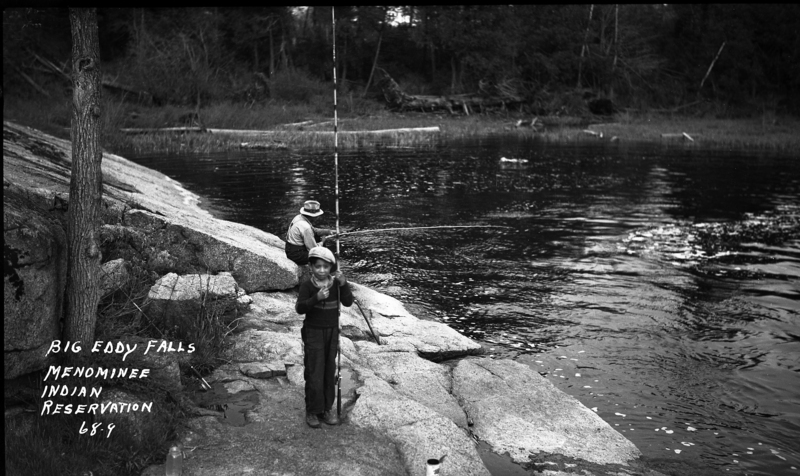 Dams were removed, native brook trout, decimated by logging, began to repopulate the river and rainbow trout were introduced. Today the Wolf continues to be a destination for sports fishermen as well as paddlers. The Wolf River, 225 miles long, is one of two National Scenic Rivers in Wisconsin, along with the St. Croix. It is protected by the National Wild and Scenic Rivers Protection Act of 1968. Restoration of the Wolf as a scenic waterway began after the heyday of river drives but did not always go smoothly. A drought in 1931-1933 led to diversion of water to farms. Excessive use of pesticides in the 1950s and the threat of a polluting mine in Crandon, headwaters of the Wolf, in the 1970s all motivated a number of conservation groups to become active in preservation of the river. In 1967 the Federal Government, through Secretary of the Interior Stewart Udall, and with Senator Gaylord Nelson providing the impetus, allocated half a million dollars to preserve nearly 90 miles of the Wolf River and its various feeder streams in Langlade and Menominee Counties. This has become an excellent example of restoration of a natural setting and the benefits that derive from that restoration. As a tourist destination it has impacted the Menominee Reservation as well as Langlade County economically. 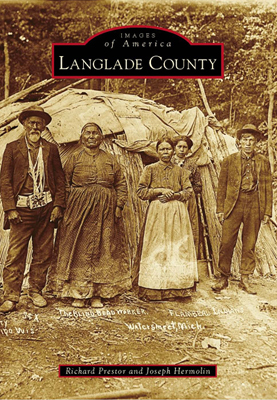 Langlade County Historical Society information online at http://recollectionwisconsin.org/map website. The CCC was one of the most successful of the New Deal projects implemented by FDR. 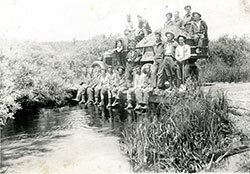 It provided work and training for many young men and financial support for their families. Camp 657 was established, in June, 1933 at Summit Lake in Langlade County. More permanent barracks were erected at nearby Otter Lake, in Elcho. In November 1933 the recruits marched in from their tents at Summit Lake to their new barracks in Elcho. Camp 657 primarily did reforestation in a region that had been clear cut by the logging industry. Enrollees planted almost 1,400 acres and also build fire roads, lookout towers, fire breaks, did stream and pond development with fish stocking, improved conditions for wild game and established 3 acres of public campgrounds. More than 75 years after the camp ceased its existence the benefits of their efforts are still enjoyed in Langlade County. 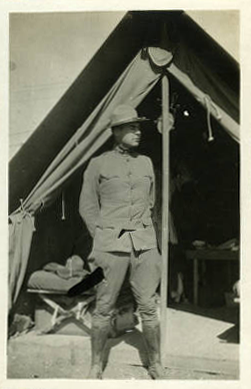 Photos, camp newsletters, and memorabilia of Camp 657 Elcho may now be viewed at www.recollectionwisconsin.org (in the search window, type �ccc camp 657 elcho�). 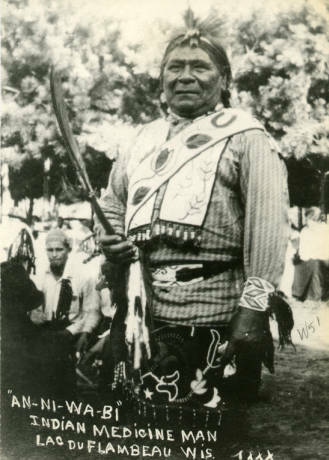 Images of Ojibwe and Menominee Indians in northeast Wisconsin and Michigan�s Upper Peninsula in the early 20th century, photographed by Arthur J. Kingsbury of Antigo. 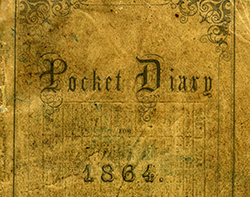 Letters written to family members by Francis Deleglise, founder of the city of Antigo, during his service in the Civil War. The railroad photographs in the collection of the Langlade County Historical Society depict depots, rail yards, rail crews, locomotives, and train wrecks in the Antigo area from the late 19th century to the 1990s. View collection. 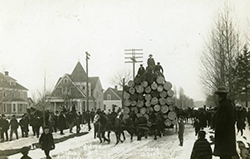 The logging photographs in the collection of the Langlade County Historical Society document work crews, logging camps, sawmills and other aspects of Wisconsin�s logging industry from the 19th century to the 1990s. In World War I Langlade County men formed the 107th Trench Mortar Battery Company. They saw action in France and participated in the Meuse-Argonne Offensive. William Wessa documented the 107 TMB with photos and a written history. Rueben Sweet left Manitowoc in 1863 to fight in the Civil War. He participaed in Sherman's March to the Sea. We wish to thank all the individuals and companies and organizations that are contributing to our Let�s Make History Building Campaign. We are moving towards our goal. Rosemary Barnes, Patricia Barta, John and Shirley Boudry, Trinidad and Kathleen Cuellar, Francis and Donna Gilson, Gary and Ruth Gray, Paul and Marlene Grinde, Judd and Bonnie Hollister, Dale Lenzner and Kristine Flowers, Janelle Markgraf, John and Elsa McKenna, Troy and Lisa Sennholtz, Lucienne Stege, Jim and Toni Thomas, Tonya Trabant and Patrick McKenna, Warren and Jane Wagner, Charles and Amy Zanayed.